This section is an overview of the ACRN hypervisor startup. The ACRN hypervisor compiles to a 32-bit multiboot-compliant ELF file. The bootloader (ABL or SBL) loads the hypervisor according to the addresses specified in the ELF header. The BSP starts the hypervisor with an initial state compliant to multiboot 1 specification, after the bootloader prepares full configurations including ACPI, E820, etc. The HV startup has two parts: the native startup followed by VM startup. BSP Startup: The starting point for bootstrap processor. Relocation: relocate the hypervisor image if the hypervisor image is not placed at the assumed base address. UART Init: Initialize a pre-configured UART device used as the base physical console for HV and Service OS. Shell Init: Start a command shell for HV accessible via the UART. Memory Init: Initialize memory type and cache policy, and creates MMU page table mapping for HV. Interrupt Init: Initialize interrupt and exception for native HV including IDT and do_IRQ infrastructure; a timer interrupt framework is then built. The native/physical interrupts will go through this do_IRQ infrastructure then distribute to special targets (HV or VMs). Start AP: BSP kicks INIT-SIPI-SIPI IPI sequence to start other native APs (application processor). Each AP will initialize its own memory and interrupts, notifies the BSP on completion and enter the default idle loop. Symbols in the hypervisor are placed with an assumed base address, but the bootloader may not place the hypervisor at that specified base. In such case the hypervisor will relocate itself to where the bootloader loads it. 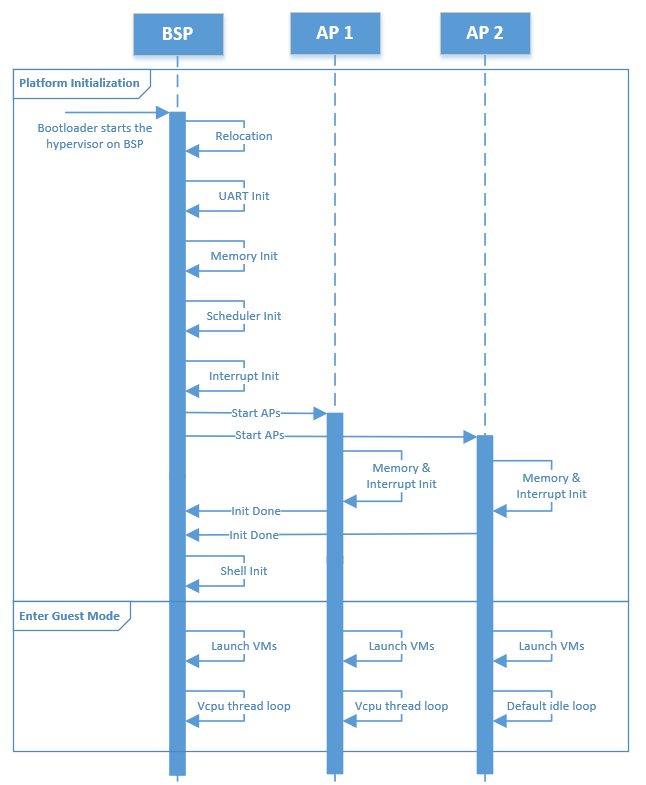 Here is a summary of CPU and memory initial states that are set up after native startup. cr0: The following features are enabled: paging, write protection, protection mode, numeric error and co-processor monitoring. cr3: refer to the initial state of memory. cr4: The following features are enabled: physical address extension, machine-check, FXSAVE/FXRSTOR, SMEP, VMX operation and unmask SIMD FP exception. The other features are disabled. MSR_IA32_EFER: only IA32e mode is enabled. MSR_IA32_FS_BASE: the address of stack canary, used for detecting stack smashing. MSR_IA32_TSC_AUX: a unique logical ID is set for each physical processor. stack: each physical processor has a separate stack. All physical processors are in 64-bit IA32e mode after startup. The GDT holds four entries, one unused, one for code and another for data, both of which have a base of all 0’s and a limit of all 1’s, and the other for 64-bit TSS. The TSS only holds three stack pointers (for machine-check, double fault and stack fault) in the interrupt stack table (IST) which are different across physical processors. LDT is disabled. Refer to section 3.5.2 for a detailed description of interrupt-related initial states, including IDT and physical PICs. After BSP detects that all APs are up, BSP will start creating the first VM, i.e. SOS, as explained in the next section. SOS is created and launched on the physical BSP after the hypervisor initializes itself. Meanwhile, the APs enter the default idle loop (refer to vCPU Lifecycle for details), waiting for any vCPU to be scheduled to them. Create VM: A VM structure is allocated and initialized. A unique VM ID is picked, EPT is created, I/O bitmap is set up, I/O emulation handlers initialized and registered and virtual CPUID entries filled. For SOS an addition e820 table is prepared. Create vCPUs: Create the vCPUs, assign the physical processor it is pinned to, a unique-per-VM vCPU ID and a globally unique VPID, and initializes its virtual lapic and MTRR. For SOS one vCPU is created for each physical CPU on the platform. For UOS the DM determines the number of vCPUs to be created. SW Load: The BSP of a VM also prepares for each VM’s SW configuration including kernel entry address, ramdisk address, bootargs, zero page etc. This is done by the hypervisor for SOS while by DM for UOS. Schedule vCPUs: The vCPUs are scheduled to the corresponding physical processors for execution. 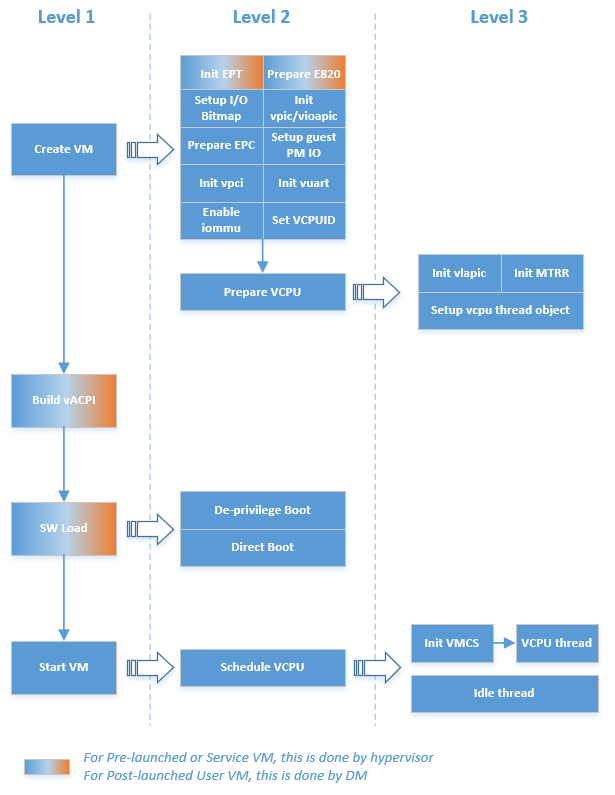 Init VMCS: Initialize vCPU’s VMCS for its host state, guest state, execution control, entry control and exit control. It’s the last configuration before vCPU runs. vCPU thread: vCPU kicks out to run. For “Primary CPU” it will start running into kernel image which SW Load is configured; for “Non-Primary CPU” it will wait for INIT-SIPI-SIPI IPI sequence trigger from its “Primary CPU”. ACPI: HV passes the entire ACPI table from bootloader to Service OS directly. Legacy mode is currently supported as the ACPI table is loaded at F-Segment. E820: HV passes e820 table from bootloader through multi-boot information after the HV reserved memory (32M for example) is filtered out. Zero Page: HV prepares the zero page at the high end of Service OS memory which is determined by SOS_VM guest FIT binary build. The zero page includes configuration for ramdisk, bootargs and e820 entries. The zero page address will be set to “Primary CPU” RSI register before VCPU gets run. Entry address: HV will copy Service OS kernel image to 0x1000000 as entry address for SOS_VM’s “Primary CPU”. This entry address will be set to “Primary CPU” RIP register before VCPU gets run. ACPI: the virtual ACPI table is built by DM and put at VMx’s F-Segment. Refer to I/O Emulation high-level design for details. E820: the virtual E820 table is built by the DM then passed to the zero page. Refer to I/O Emulation high-level design for details. Zero Page: the DM prepares the zero page at location of “lowmem_top - 4K” in VMx. This location is set into VMx’s “Primary CPU” RSI register in SW Load. Entry address: the DM will copy User OS kernel image to 0x1000000 as entry address for VMx’s “Primary CPU”. This entry address will be set to “Primary CPU” RIP register before VCPU gets run. Note that SOS is started with the same number of vCPUs as the physical CPUs to boost the boot-up. SOS will offline the APs right before it starts any UOS.